Build Your Own DIY Mountain Cargo Bike. 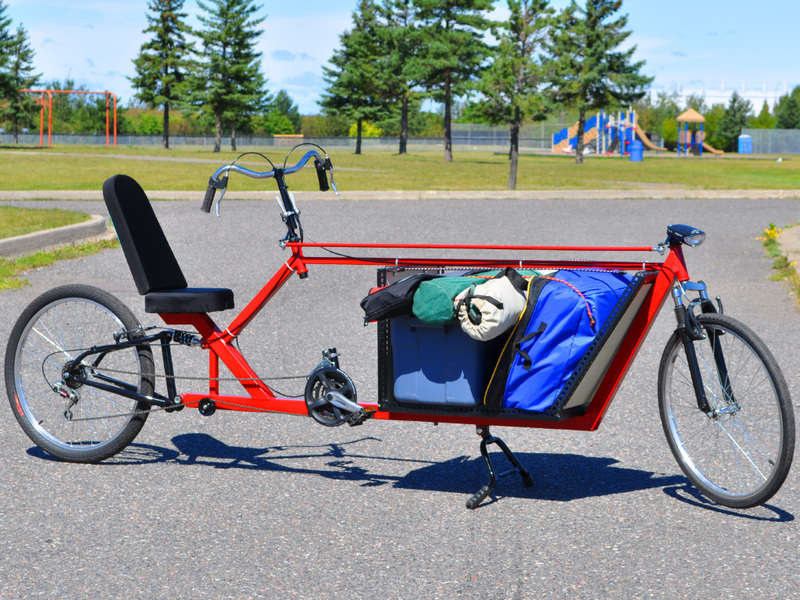 The Dutchman DIY full suspension cargo bike combines a long wheelbase recumbent bicycle with a versatile cargo bike. Offering full suspension and an adaptable cargo bay, the Dutchman DIY cargo bike can move hundreds of pounds smoothly and under complete control. 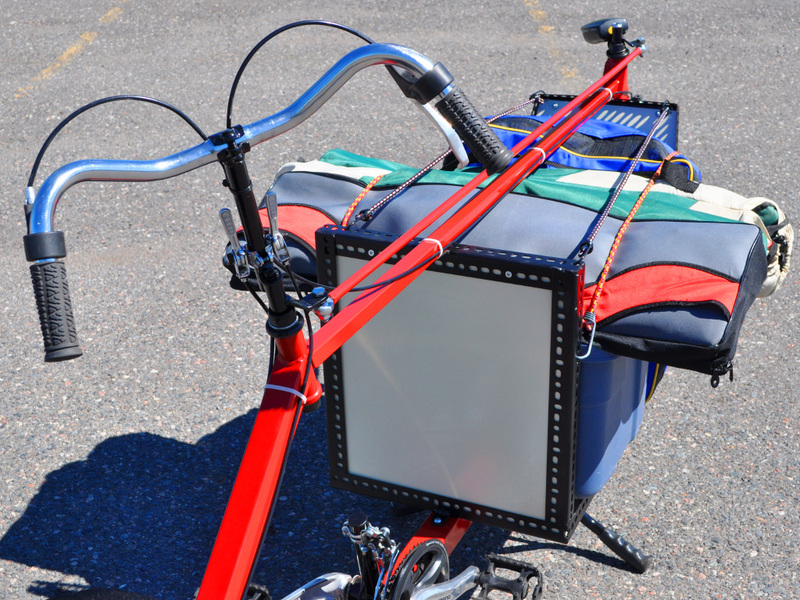 The unique cargo perimeter frame offers extended strength and durability so that massive or very wide loads can be easily handled by this hardy cargo bike. The cargo bay is easily adaptable to many different types of cargo boxes, including the removable open sided box shown in the plans. Your can easily swap out the cargo box from the frame, allowing for easily adaptation to the moving job at hand. Move Your Stuff With Ease. The pilot’s area is configured as a semi-recumbent bicycle with over seat steering for maximal control and smooth handling. Having the steering linkage and an extra frame tube over the cargo area makes the DutchMan able to carry massive cargo loads, limited in width by only the road you intend to travel on. The cargo is placed so that the weight is below the rider, making the bike feel stable and smooth no matter how much weight you are transporting. The efficient and comfortable recumbent seating position allows for some serious pedal pushing up those larger hills, so you can tackle any terrain on moving day. Full suspension offers a super smooth ride, even on a rough gravel road the to the mountain bikle roots. The DutchMan cargo bike includes a large cargo bay that can be adapted to many different types of cargo boxes or a flatbed platform. The plan includes a simple three walled cargo bed that can be installed or removed from the cargo area using a few bolts, making it easy to create several different styles of cargo boxes for your shipping needs. A fully enclosed cargo box could easily be installed for moving fragile cargo in hostile weather conditions. All of the suspension parts can be taken from a single salvaged mountain bike, easily modified for use on your DIY cargo bike. You can also install as many speeds as you like, including a super low range gear for climbing hills with your loaded cargo bike. 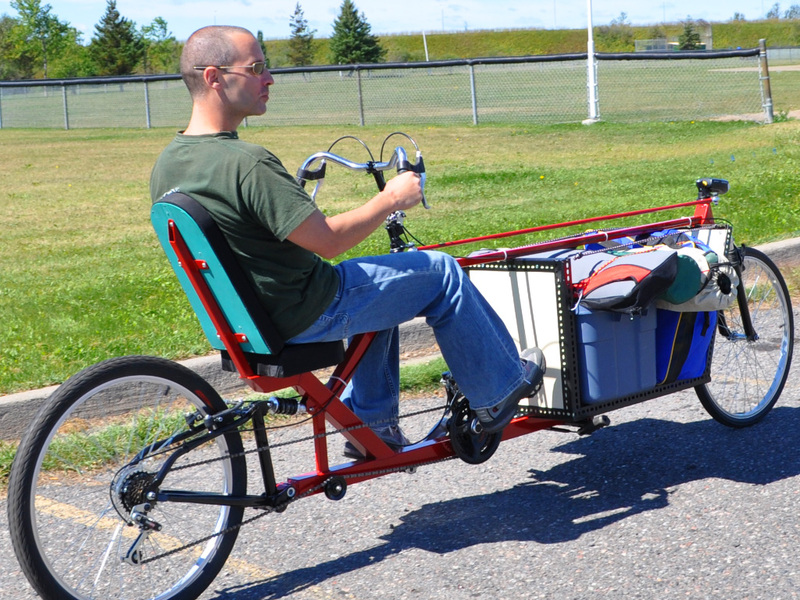 Add Your Own Mods to This DIY Cargo Bike. You can move anything from groceries to a load of bricks with the versatile and sturdy DutchMan cargo bike, and it can be built by anyone using basic tools and components. 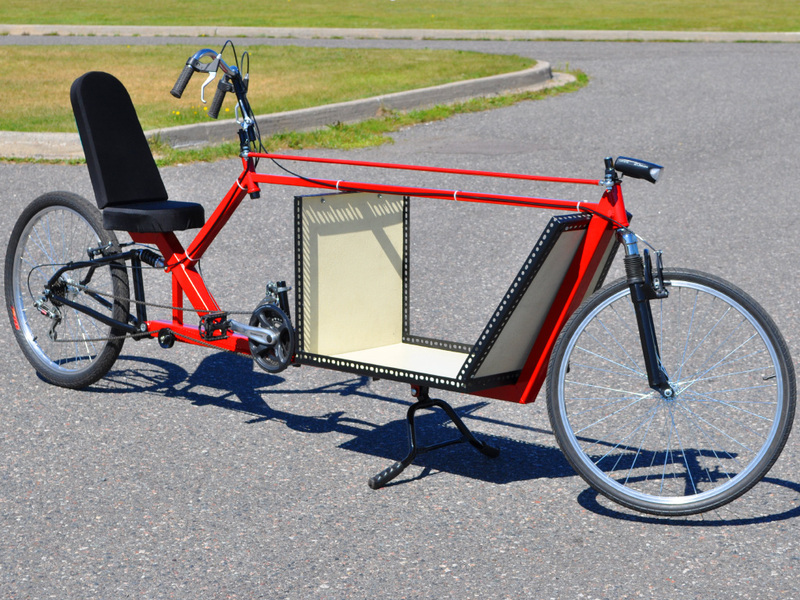 Our DIY cargo bike plan shows you how to use the parts from a standard upright suspension bike in order to build your very own custom load carrying recumbent bike. There is plenty of room to modify the design from our original plan in order to create your own version of the Dutch style cargo bike. 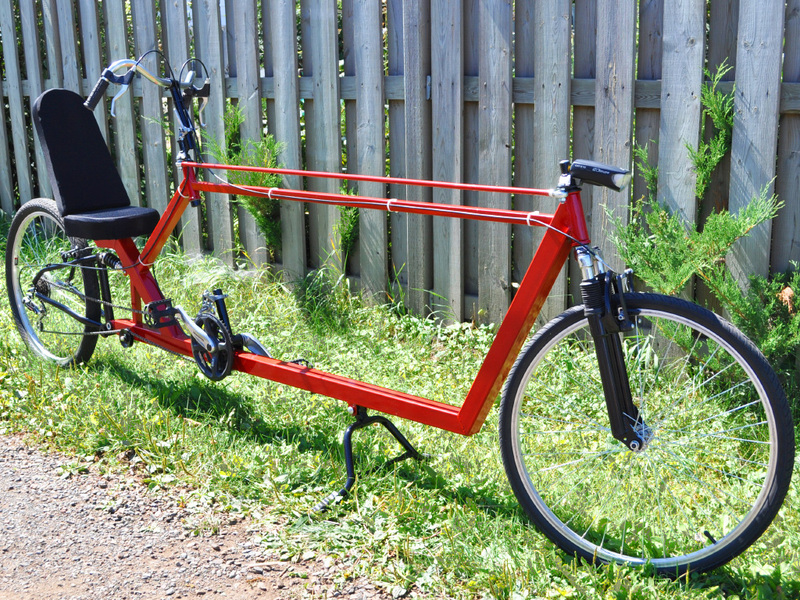 This DIY dutch style cargo bike also includes a sliding bottom bracket that allows the easy adjustment of the cranks to support riders of any height. The main frame is made from common square steel tubing, so it is easy to cut and weld. Build This Cargo Bike on a Minimal Budget. Square steel tubing is used in the frame for extended strength, and you will only need the most basic tools in order to build your own DIY cargo bike from our plans. Even the seat is made using basic materials, so the entire project can be done on a tight budget. The entire transmission is built using the salved components from one mountain bike. All gear shifters and brake levers function exactly like they did on the original parts bike, so there is no learning curve required. 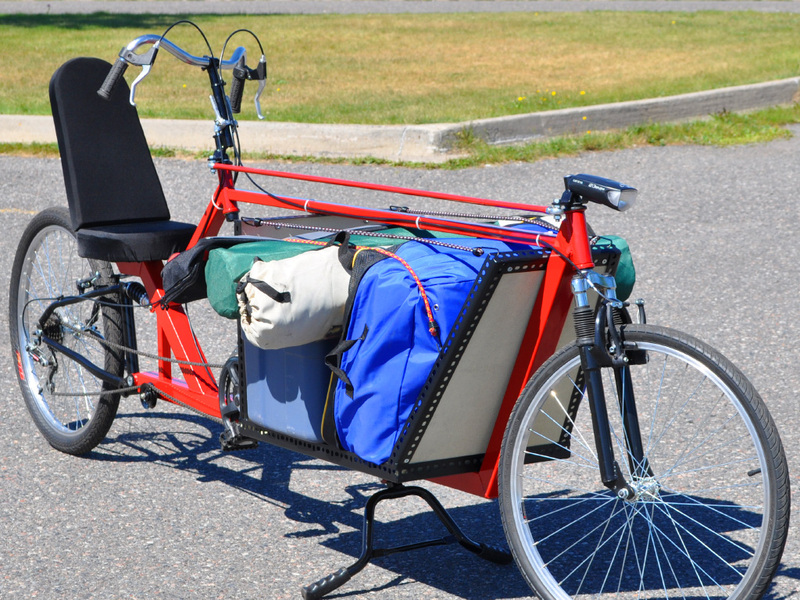 Your versatile DIY cargo bike will perform like any regular bicycle. The DutchMan cargo bike can carry just about anything you can fit in the cargo bay, and there is plenty of room for a battery pack and an electric assist motor to help you up any steep hills you may have to contend with. Pack up your camping gear and hit the trail, or start a cycle courier business - the possibilities are endless when you can move so much cargo under leg power and travel where gas powered vehicles cannot. The cargo box is easily removed as well. Recumbent seating is far more comfortable than and upright bicycle seat. You can build the foam and plywood seat shown in the plans, or try something completely different like a car or boat seat for extreme comfort. You can always add your own mods. You Can Load a Lot of Stuff Into This Cargo Bike. Every single step of the build is shown in great detail, and the plans assume you have only the basic tools such as a hand drill, angle grinder, and a basic welder. 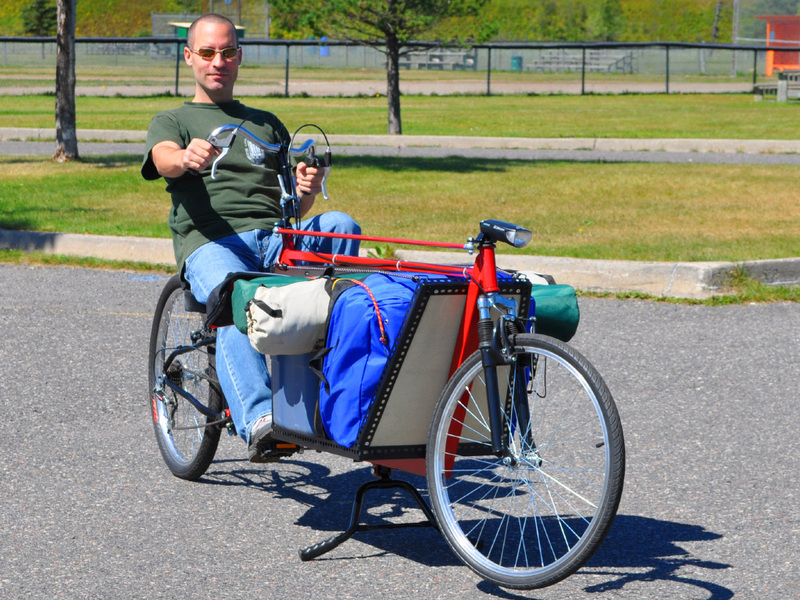 Add your own modifications and you can create your own unique DIY cargo bike. It is easy to change the size of the cargo area so you can carry anything imaginable. The retractable center stand holds up your DIY Cargo Bike so you can load up your stuff while the bike is held upright. Swap out your cargo bays, or park your bike for unloading, safely secured by the stable center stand. Recumbent seating and over seat steering makes it feel like you are driving your car, but without all of the noise and fuel costs. If you have been looking for a way to get some exercise and save huge on fuel costs, then this DIY cargo bike is the perfect solution. In a few weekends, you can build your own cargo bike on a small budget. As gas and insurance prices continue to rise, human power is becoming a more sensible solution to the car problem, especially in urban areas where parking is next to impossible or cost prohibitive. 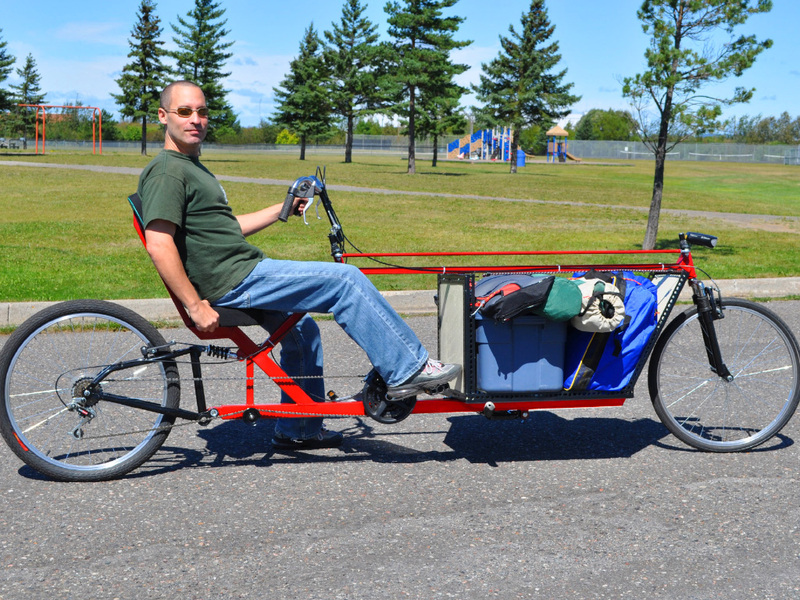 This easy to build DIY recumbent cargo bike plan will help you move your stuff across town and you will have a good time doing it.